The body is made up of different cells and each type of cell has important functions. 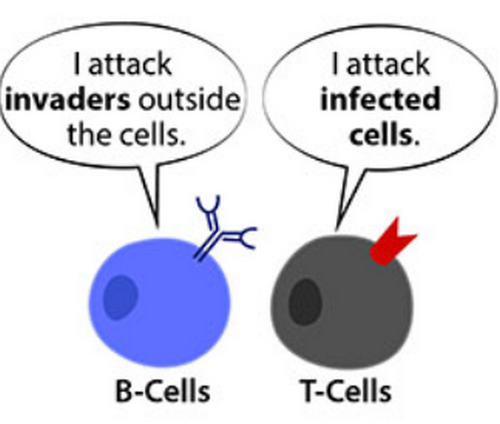 In this article, we are going to discuss T cell and B cells; their roles and differences. Picture 1: T cells are a component of lymphocytes. Picture 2: T cells helps fight off cancer cells. What are the types of T cells? Killer T cells – These T cells have x-ray vision. They can see the inside of the body’s own cells by scanning the surface. They can easily hunt and destroy infected cells. Helper T cells – These T cells assist in immune response. Suppressor T cells – These T cells block the actions of other types of lymphocytes. What are the roles of T cells? They scan the inner structure of foreign invaders. They help eradicate cancer cells. They have the ability to remember invaders they encountered a long time ago. They help other immune cells in detecting and ingesting harmful cells. Picture 3: A closer look at B cells, a component of lymphocyte. What are the roles of B cells? They are involved in the body’s response to foreign invaders through humoral immunity. They signal other immune cells to destroy the invaders. Some activated B cells become memory cells and live in the bone marrow, spleen, and lymph nodes. They have the ability to remember antigens they encountered in the past. Hence, B cells give long-lasting immunity to various invaders. They regulate the construction of antigen receptors. They play a vital role in antibody production. They export all the needed cells in the periphery. Picture 4: A comparison image between T cells and B cells. 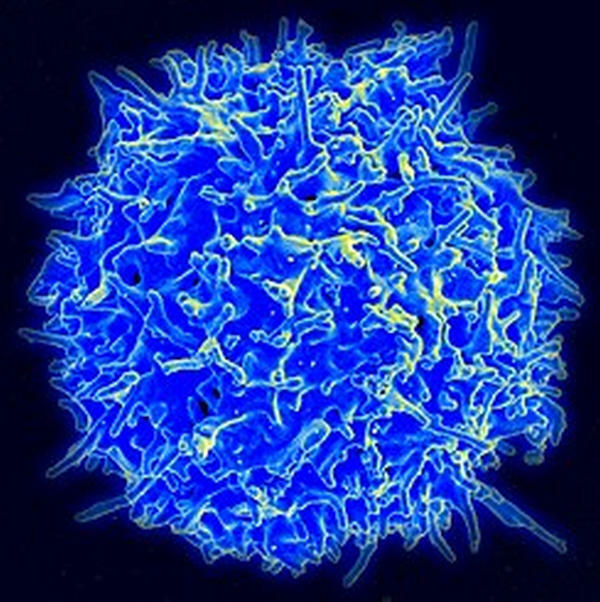 T cells – They are lymphocytes that originate in the bone marrow and mature in the thymus. B cells – They are lymphocytes that originate and mature in the bone marrow. T cells – They are positioned inside the lymph nodes. B cells – They are positioned outside the lymph nodes. T cells – They recognize antigens found outside of the infected cells. T cells – They are distributed in the lymph nodes specifically in the parafollicular area of the cortex and the periarteriolar lymphoid sheath of the spleen. T cells – They do not have surface antibodies. B cells – They have surface antibodies. T cells – They have a long lifespan. B cells – They have a short lifespan. T cells – They secrete lymphokines. T cells – 80% of the blood lymphocyte is composed of T cells. 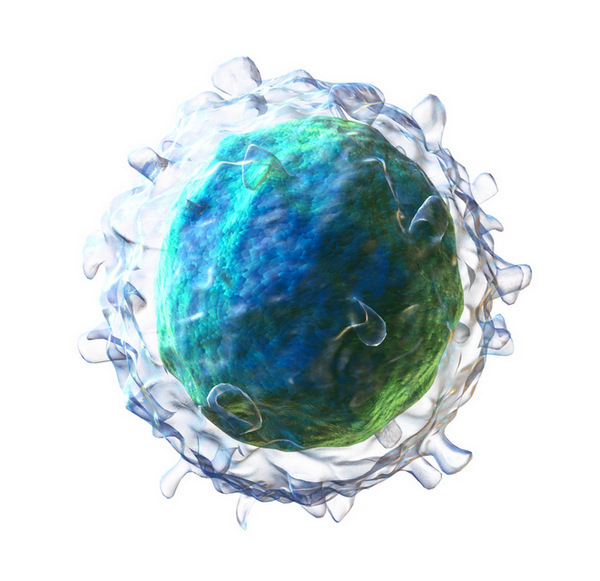 B cells – 20% of the blood lymphocyte is composed of B cells. 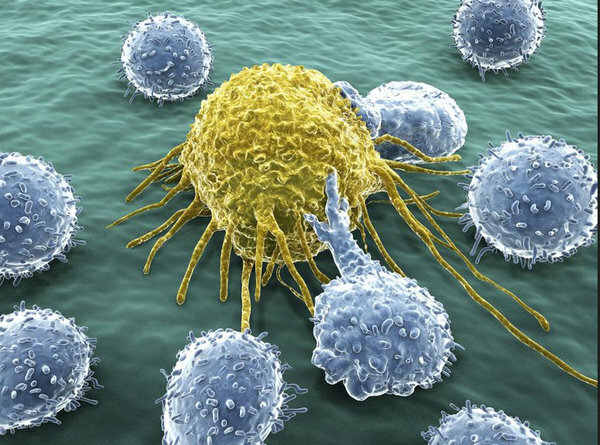 T cells – Cell-mediated immunity. T cells – There are three types: helper T cells, killer T cells, and suppressor T cells. B cells – There are two types: plasma cells and memory cells. T cells – They move right away to the infection site. B cells – They do not move to the infection site. T cells – They act against the transplant and tumor cells. B cells – They do not act against transplant and tumor cells. T cells – A particular type of T cell, specifically suppressor T cell has an inhibitory response to the immune system. T cells – They fight almost all pathogens which include but not limited to viruses, fungi, and protists that enter the body. B cells – They fight against viruses and bacteria in the lymph and bloodstream. Refer to the table below for a detailed comparison between T cells and B cells.